Liberal Bohemian: This is the 3rd day of Saturnalia. 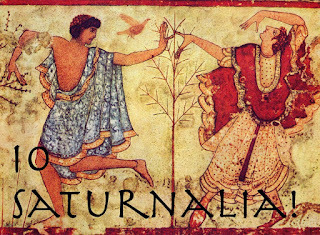 This is the 3rd day of Saturnalia. On the third day of the Saturnalia, the ancient Romans celebrated the Opalia, a feast dedicated to Ops (Abundance), the harvest goddess of fertility and success, and the consort of the god Saturn. This day was also sacred to the Roman fertility goddess Sabine. A Tarot Look At 2017! Crom Cruaich, Bad Ogre or Good Guy? December 25th: a wonderful day to be a witch. An Esoteric Look at December 22nd. The solstice lunar eclipse is here! On Nostradamus's Birthday, I wonder about Trump. It sure is starting to look a lot like Christmas.